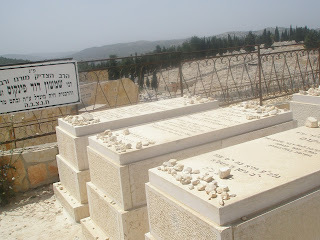 During a visit to Eretz Yisroel a few years ago, on my last day there, I went with my brother Yaakov to Har Menuchos, the vast and renowned cemetery overlooking the hills of Yerushalayim. Although there are innumerable great and holy people buried there, being that my time was limited, I particularly wanted to visit two kevarim (plots): my Zaydei, Rabbi Yaakov Meir Kohn zt’l, and Rav Shimshon Pinkus zt’l. I knew exactly where my Zaydei was buried and have been there on several occasions in the past. It was uplifting to pray there, especially with my brother Yaakov standing at my side. Although I never merited meeting Rav Pinkus while he was alive, I consider him a personal Rebbe, and he has had a profound impact on me through his sefarim and recorded lectures. For that reason, I very much wanted to daven at his kever. The only problem was that I had no idea where it was. The only thing I knew is that he is buried on Har Tamir, the mountain adjacent to Har Menuchos where my Zaydei is buried. Despite numerous phone calls and inquiries, no one that I asked seemed to have any more precise details about where Rav Pinkus is buried. Normally that isn’t an issue because there is an office at the entrance of the cemetery and they have on file the location of every plot. But the day we were there was Yom Ha’atzmaut, and the office was closed. Finally, we dejectedly headed down to the entrance. I told my brother Yaakov that we would ask one more person, and if he didn’t know, we would leave. The person we asked motioned that we should ask another person in a car who was driving away slowly. I debated if I should even bother to ask, but in the end, I did. In my mind, I was waiting the same answer I had received until now. But to my surprise, the man took out his phone, made two phone calls, and then motioned for us to get in his car. It is always encouraging when someone does a chesed for you, simply for the sake of doing chesed. With nothing but altruistic motives in mind, the man drove us back up the hill to the plot where Rav Pinkus was buried. Amazingly, it is only three sections over from where my Zayde is buried. I randomly opened my Tehillim to say three or four psalms. It opened to chapter 61 and without thinking much about it I began davening. At the conclusion of the chapter it says the word “Mon” which is compelling, because Rav Pinkus’s father-in-law’s name was Rav Mon zt’l. I continued davening until I reached chapter 63. In the middle of the chapter, my eyes widened and I literally felt a chill go down my spine. I placed my hands on the matzeivah (monument), to hold my balance. I reached a verse which I am familiar with only because I had heard it quoted by Rav Pinkus on different tapes, and in his writings. I don’t know if there is any other verse in all of Tanach that I know so well only because of Rav Pinkus. The pasuk states, כי טוב חסדך מחיים שפתי ישבחונך" – For your kindness is greater than life, my lips will praise you. Malbim explains the pasuk with a Parable: There was a man who was extremely ill and was admitted to the hospital for emergency care. There was one particular doctor who took responsibility for the man, performing numerous procedures and surgeries until his health was restored. During the time that the doctor faithfully worked on his patient, they developed a deep friendship with each other. Someone approached the man after he was discharged from the hospital and asked him what happened while he was there. The man replied that this doctor saved his life. Not only that, he also became close friends with the doctor. The man on the street asked the patient what was more precious to him - the newfound friendship, or the fact that the doctor saved his life. The man smiled; it’s always valuable to have good friends, but what is the purpose of having friends if one is dead? Surely, the fact that the doctor saved his life was more valuable to him than the friendship. The Malbim explains that Dovid HaMelech was stating that the relationship he felt toward G-d, as it were, was even more precious to him than all other goodness that G-d granted him. “For your kindness is greater than life itself”. About which kindness was Dovid referring? To the mere fact that, “My lips will praise you”, i.e. that Dovid could pray to G-d and know that G-d listens and cares about his every whim. That was more valuable to him than life itself. Life is finite and transitory, but a relationship with G-d is eternal and Divine. At the beginning of Sefer Bamidbar the Torah records the national consensus of the nation conducted by Moshe. Rashi explains that the count reflected G-d’s eternal love for His Nation. Just as one carrying precious gems will constantly pat his pockets and take out the gems and count them repeatedly to ensure that they are all there, so did G-d repeatedly count His Nation. When the Torah records each tribe, it begins with the words, “לבני – For the Children of”. It then mentions the name of the tribe and continues to list the tallied population of its members. However, when the Torah records the tally of the final tribe – Naftali – it says “B’nei Naftali…” without the preceding ל.
AriZal explained that, truthfully, there was no need to have an official tally of the tribe of Naftali. Since the final tally of the entire nation was already known, by simply adding the totals of the rest of the tribes and reckoning how much was missing, Moshe could have figured out the numbers for the tribe of Naftali without bothering to count each one. Yet every member of Naftali was counted to demonstrate the fact that G-d loves and values every individual. The Medrash notes that Klal Yisroel is analogous to the stars. The verse in Tehillim states, “Praise Him every star of light.” Though some stars appear to be dim or even dark every star contains a tremendous force of illuminating energy, it just may be too distant to be seen with the naked eye. Every Jew is analogous to a star in that every Jew contains a holy spark that illuminates within. At times that light may be dimmed but, like every star, the light never completely ceases to shine. For the last number of years, a company has been advertising that you can name a star after someone and present it to them as a gift for a fee. They will enter the name in the ‘Star Registry’ and it will be an eternal gift that the receiver will always cherish. For the provider, it is a smart way to make easy money with virtually no cost. Rabbi Avrohom Chaim Feuer once noted that, aside from whether one wants to spend money on such an idea, the names we decide are not accurate. “He counts a number for the stars; to each one He calls a name.” G-d Himself names each star. Every time we perform a mitzvah, or perform a good deed, we create a star. Those stars bear our name and receive their light from our actions and deeds. Every Jew must realize his own innate unique greatness, and that he has a portion of Torah no one else in the world is privy to. That understanding is a vital prerequisite for accepting the Torah. One must realize that G-d not only allows us to draw near to Him, as it were, but He awaits it. The truth is that the entire chapter 63 is really appropriate for Rav Pinkus. The chapter describes longing and yearning to be close to G-d, which is how Rav Pinkus lived his life. His foremost message was that we can and must develop a real relationship with our Creator Who loves us more than we can know. I was told that anyone can name a star and copyright it under the USA copyright laws if they want. Our family’s Rav when he was the Rabbi of Kehillas Bais Avrohom in Monsey, NY.